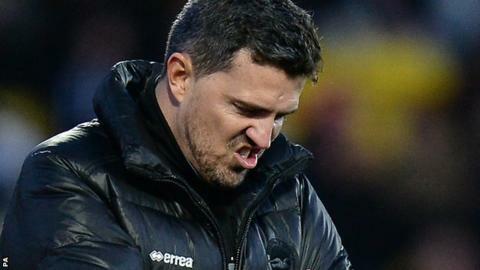 Brighton have accepted head coach Oscar Garcia's resignation following their Championship play-off semi-final loss. The Seagulls, who finished sixth this season, were beaten 4-1 at Derby on Sunday as they suffered a 6-2 aggregate defeat. Coaching: Catalonia (assistant), Barcelona (youth), Maccabi Tel Aviv (manager), Brighton (head coach). "The club has been aware of my thoughts for several weeks," the Spaniard told the club website. "During this time, I have had discussions with both the chairman, Tony Bloom, and chief executive, Paul Barber. "The club will always have a place in my heart and I hope very soon they will be competing at the top level in English football." Bloom added: "We are extremely grateful to Oscar for his efforts this past year, and for providing us with another exciting and memorable season at the club." Garcia appeared coy over his future in his post-match interview following the second-leg defeat by the Rams. "The squad gave me everything and it has been a real pleasure to be their manager," the 41 year-old told BBC Sussex. Brighton recovered from a slow start to the season to finish in the play-off places, helped by an eight-match unbeaten run. Garcia played for Barcelona for six years and also had a spell coaching their youth team before guiding Maccabi to the league title last season.